A great afternoon at the Norton Public Library working with the enthusiastic Children's Librarian Lee Parker and a gathering of parents with children from ages 2 to teen with a few adults coming to have fun of their own. 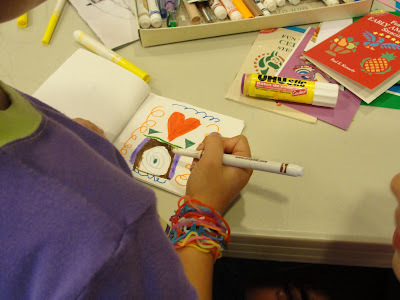 We had three stations to make three simple books: accordion, stick and elastic, and hot dog booklet plus one with stencils, collage papers, glue, and markers. Our recycled paper was a blast from the past—paper left from a dot matrix printer. Some of the kids left with handfuls of strips with holes for projects at home. The workshop was funded by the Norton Cultural Council which is a chapter of the Massachusetts Cultural Council. View some of the books here. And here is a slide show the library created about the workshop.